Never miss a luxury moment. Access the latest luxury business news and analysis, marketing and retail campaigns, features, special reports and live coverage during business hours. Check the $12 for 12 weeks offer for 22 percent off the annual subscription price. 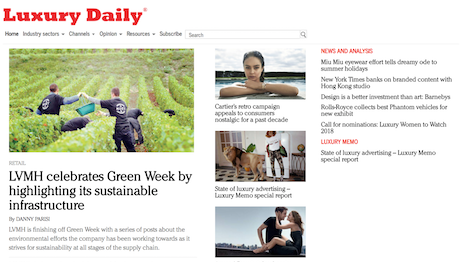 Please click here to subscribe to Luxury Daily for uninterrupted access to the publication's content including live coverage, articles, special reports, videos, images and the archive. Do not miss a single story we publish. You need this intelligence to keep you up-to-speed. No one else covers luxury like we do. $12 for 12 weeks. Please click here to subscribe for continued access to all of our content, including articles, videos and images that highlight the strategic developments in the luxury business. Are you a student? Please click here to access the student rate. Please apply the subscription as a business expense. Please click here to subscribe to Luxury Daily for uninterrupted access to the publication.